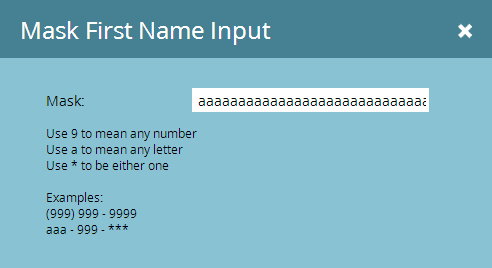 You've seen before that the Forms 2.0 input mask plugin can be tweaked to do some more elegant stuff. Here are a few more things you might want to do. I only recommend masks for things that have an explicit standard (like phone numbers, credit cards, etc.). But if you're going to use them for more than that, use them wisely! The code is bundled at the bottom of the post. By default, the mask shows a _ character in every empty position up to the max length. This can look ugly, especially if there's already a hint in the field telling people it's limited to N characters. You can remove the placeholder character entirely or replace it with something else (though I'm not sure anything is better than underscore or blank in this case, maybe a cursor block like ░ if you want to be retro-cool?). … you're actually blocking all but the slimmest subset of alphanumeric characters.Even the e-with-acute-accent in Grégoire is blocked! That's not good when words contain these slightly out-of-the-American-ordinary characters. It works this way because, under the hood, input masks use the regex character class [A-Za-z] to implement a. And that's ASCII unaccented letters only. Better still, if you're in the world of names, allow hyphens, apostrophes, periods, and spaces: [A-Za-z\u00C0-\u024F'. -]. When you set a mask to **********, even if you don't want non-ASCII, non-accented characters, do you really mean that spaces aren't allowed? Sometimes yes, sometimes no. In the case of ISBN-10s, for example, no spaces are allowed per the international standard, and you might want to block spaces in the Phone field for standardization. But in the case of First or Last Name, Company, or tons of other cases, you certainly don't want to block spaces. All of the above functions can be enabled with the helper JS below. Then add your custom patterns to the inputMasks array as below: the name property is the Marketo form field name and the rest is explained in the comments.